Never mind that Formula One is already the most difficult event to get media accreditation for—Bernie Ecclestone wants to limit the number of freeloadin' Internet journalists at F1 races. How can someone so adept at trolling understand the Internet so little? Inautonews reports that after poo-pooing the influence of social media last week, he's now saying that online bloggers who somehow manage to jump through all of F1's hoops and still get accreditation are just in it for the free access. "Choose your race for free, enter the paddock, meet the drivers. How do you do it? 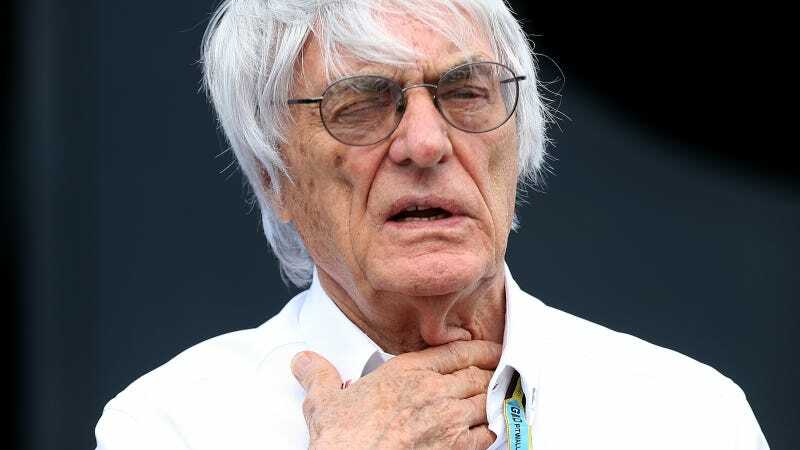 Set up a website," explained Ecclestone to F1 journalist Christian Sylt. "I'm going to have a good look at the accreditation because it is a bit of a joke." Uh-huh, sure, buddy. While the "wander lots of places" media pass is practically the best seat in the house, those of us who show up to blog about races tend to leave with blistery feet and sometimes a waterlogged camera. Note that I'm basing this assumption that covering F1 race weekends results in sunburn, blisters and thousands of photos to dig through off of other race weekends because I've never been able to get a media pass for F1 weekend. Nope. Zero. Zip. Nada. Other FIA events, sure! F1's media deadline closed when I started on Black Flag, though, and the two other years it's been in town, I've either not been writing for anyone or had alternate plans to just sit with friends and enjoy the race, dang it. Other Jalopnik writers, however, have been accredited for races. Fortunately, the people who actually handle the FIA's media accreditation process seem to understand how the Internet works. We're regularly asked for traffic data before the FIA lends us a pass to make sure we're actually a car website and not a fly-by-night "Mommyblogger Reviews Cars" page out to see a free race and leave with a purse full of complimentary Red Bulls*. But, hey, he's 84? Me attempting to explain the Internet to a senile bag of fish paste is like trying to teach Fluffy Bunny how to fix my router. Nope. Not gonna happen. So, if we're all covering the race from a sweet suite next year and indulging in too much delicious green chile mac 'n' cheese** at someone else's behest instead of F1's, you'll know that Bernie's anti-intert00bz bias went to work clearing the paddock of those worthless Internet mooches. If this were for the street car side of autojournalism instead of the racing one, he might have a point. But no! Racing journos generally tend to work a bit harder, laying off the jumbo shrimp and free branded USB sticks. *Red Bull supposedly makes a special-edition version just for F1 races. Special can, different flavor. Please, print journos, send one to Stef (........because I can't get in the paddock, and Bernie would like it to stay that way). **This is something else I've yet to try. I've heard rumors of this mac and cheese's existence at COTA and it is, in fact, relevant to all of my interests.